Bulletin: Adolf Hitler used the term ‘lügenpresse.‘ The word means fake news! Here’s another citation about this from The Boston Globe. And, Hitler used the phrase “Make Germany great again” Sound familiar? kept on his nightstand was a book of Hitler’s speeches! Do not dismiss this as merely another “urban myth” kind of thing…or hyperbole. This is real. This is “real” news. Facts that are corroborated by historical records, his ex-wife, and the man, Marty Davis from Paramount Pictures who gave him the book of Hitler’s speeches called “My New Order.” Trump, a sociopath , much like the one in Nazi Germany in the 1930’s, believes he is above all law and entitled to do whatever the hell creeps into his pathetically small, mean, insecure mind. Just yesterday Trump revoked the security clearance of former CIA Director John Brennan, who has become one of his harshest critics. And he has “told advisers that he wants Attorney General Jeff Sessions to have “Omarosa Manigault Newman arrested.” Newman, a Trump clone, who is as self-serving and attention hungry as Trump, is making public the tapes she recorded while in the White House. Barking in the Dark realizes that this comparison of Trump to Hitler could be construed as a cheap…You decide. 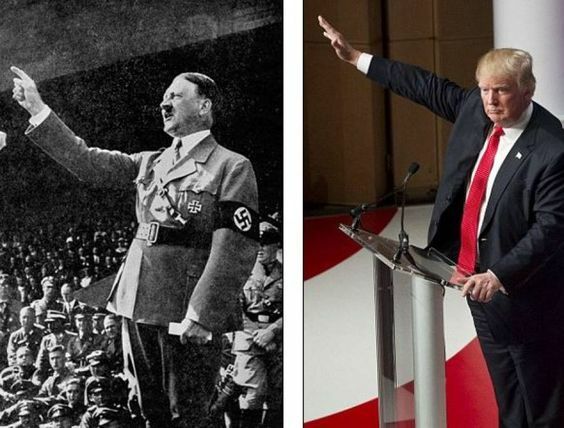 We say Herr Drumpf, the grotesque embodiment of an empty, willful, ignoramus willing to destroy all he touches in his feverish madness to achieve this illusion of “greatness” deserves this comparison. He is a dangerously unbalanced sociopath and a would-be dictator. His actions reveal his sick belief that he is our king; above our laws, above our Constitution. To ignore the seriousness of our current political situation vis-a-vis Donald J. Trump is to ignore history’s lessons. RESIST! RESIST! RESIST! RESIST! RESIST! RESIST! RESIST! RESIST! RESIST! AND PLEASE POST THE WEBSITE (VOTE SAVE AMERICA) TO ALL YOUR FACEBOOK FRIENDS. BESIDES VOTING, IT WILL BE THE MOST PATRIOTIC ACTION YOU CAN TAKE TO SAVE THIS COUNTRY. THANK YOU. « FOR BIG BROTHER – AND ITS “STARS”. . .
Another great post-Tony! This is getting scarier by the day-especially with our Liar-in-chief attacking the Mueller investigation and worrying about what his lawyer told him. These are the times that are most scary because there are no built-in protections for us when he goes off the rail. Do you know no other historical person like Hitler? This comparison is totally misleading because Hitler was not a Mafiosi with good relations to Russia just the opposite. Moreover why don’t you look in your own history of continuous white racism, this would be an appropriate approach for understanding what is happening! why don’t you tell us all “what is happening”? I sympathize…You have made me understand that an insult to Hitler is an insult to you. Certainly one does not wish to insult Hitler’s vaunted integrity which, as everyone knows, is renowned in history. Re: your comment “Hitler wasn’t a Mafiosi”.. i think you were struggling to find the correct word which is Mafioso…one mobster. Unless Hitler, being so very, very uber alles, was two or three, or most likely a multitude of mobsters – hmmm…maybe he was a “Mafiosi.” By the way do you know what a non-sequitur is? Stupidity knows no borders especially in Poland, Hungary and now also Italy. But the chauvinist policies will first of all create great damage in the countries itself like the Brexit has already done in the UK. Why people are fascinated by nationalism after two world wars unbelievable for me. I don’t know who is worse–Donald Trump or Donaldo El Trumpo (even though I just published a post about them). One ruins my days and the other ruins my nights. It’s a nightmare….and a daymare. Help! I would not want to be Republican running for office this November. If you do not like what Trump is doing, you cannot speak out against him and being a GOP or not, Trump will retaliate and do all he can to see that person lose. Then, by not speaking out, you have just admitted to yourself that we are no longer a democracy. More like a dictatorship and half-a-dozen other horrid styles of govt.